I love reuben sandwiches. The flavors, the textures, and of course the aroma of this St Patricks day delight are one of a kind. Corned beef, sauerkraut, and toasted rye bread....stop it. I'm salivating. And then I became a mainly pescetarian and the whole corned beef thing didn't really fit with that philosophy. No thanks to nitrates and poorly raised beef. Solution? Tofu ruben sandwich. Don't you even think about 'psha! '-ing the recipe because of the tofu. The seasonings in each layer of this sandwich are mindblowing. The tofu is only a protein and seasoning vehicle. Let it drive this once, okay? Even the omniverous husband loved this one. While this recipe is multi stepped with lots of little amounts of spices, it is worth the time. I'll admit I'm generally the girl who skips over ingredients under a teaspoon, but not on this one. Sauce: Reubens often contain a Thousand Island-esque dressing but this homemade version is additive free and full of extra flavors. Sauerkraut: Buy the bagged version and spice it up. Nix the can. Tofu: Tofu becomes transformed with a spice rub. Directions: Add all ingredients to a small bowl and stir to combine. Directions: Drain the sauerkraut and add to a medium sized soup pot on stove. Add onion, vinegar, pepper, fennel, and a splash of water. Stir to combine and cover on low heat for 5 mins to steam and let the flavors...mingle? Directions: Slice tofu into half inch thick sections. In a small bowl combine the rest of the ingredients to make a paste. Place tofu in rows on a baking sheet with cooking spray. Rub paste onto one side of the tofu and bake at 375 F for roughly 7 minutes or until the tofu begins to sizzle. On a stove top griddle, butter one side of a slice of rye bread and place on the warm surface. 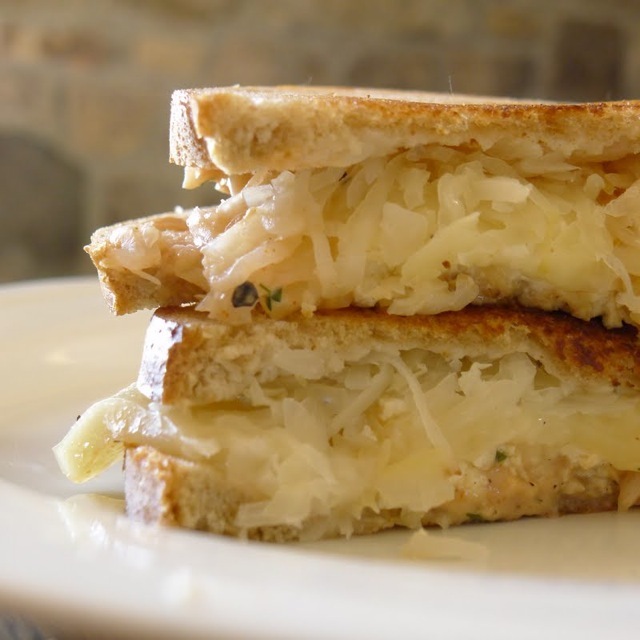 Layer sauerkraut, slices of swiss cheese, tofu, sauce another slice of bread. Flip sandwich on griddle. Toast until the cheese melts and the bread is golden brown on both sides. You'll definitely need to serve the sandwich with a side of sauce and perhaps some local brewery beverage of choice.